Hi everyone! Thanks for checking out my page. I really appreciate all the support and love! Read here about my first race as a pro! A life-long California resident, Kori attended Claremont H.S. prior to competing for Stanford University, where she earned a degree in Human Biology. Kori's best event is the 400 meter hurdles, but she also loves the 100 meter hurdles and will continue to run the event. As Kori says, "I am a hurdler." Her skill on the track was shown when she won the NCAA Championship in the 400 meter hurdles with a collegiate record time in 2013. 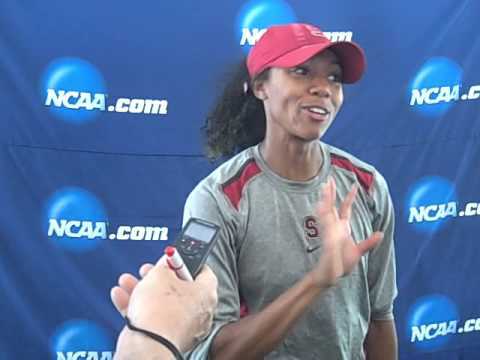 Continuing her success as a professional hurdler, Kori earned the 2014 USA Outdoor Championship in her first year post-college. In 2015, she earned a place on her first World Championships team, competing in Beijing with Team USA. Kori states that she is "a true Gemini," having two sides to herself. She is tenacious on the track, all business and intense focus. Off the track, she is a bubbly big kid, full of hugs and ready to discuss dinosaurs and Disney movies. In the classroom, Kori is interested in assistive technology and plans on attending grad school for Prosthetics and Orthotics. She is also a big fan of the Paralympics. Kori has a passion for kids, getting them involved in sports, building self-esteem and healthy lifestyle habits. She also enjoys spending time reading, dancing, and listening to music when off the track and out of the classroom.